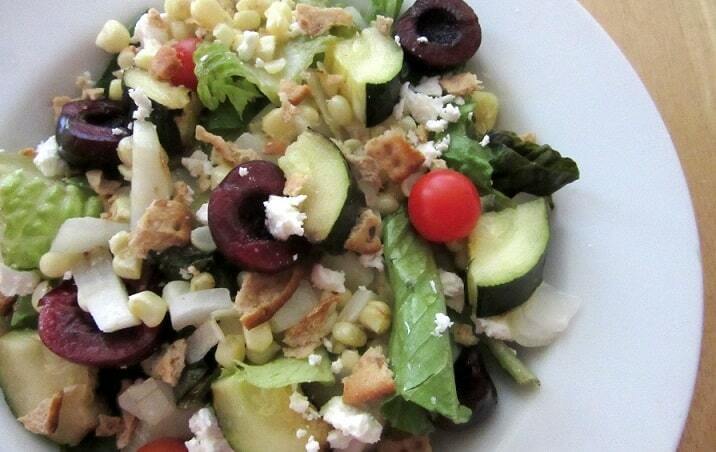 this cherry, corn and grilled zucchini salad showcases why i love salads in summer (i don’t start school til sept 22, so yes, it’s still summer). there’s so many more options for things to add in summer, and i love being able to make hearty, crunchy, elaborate salads. this one has a couple of sweet, juicy elements because i love them: corn, cherries and cherry tomatoes. zucchini for a bit of smokiness. 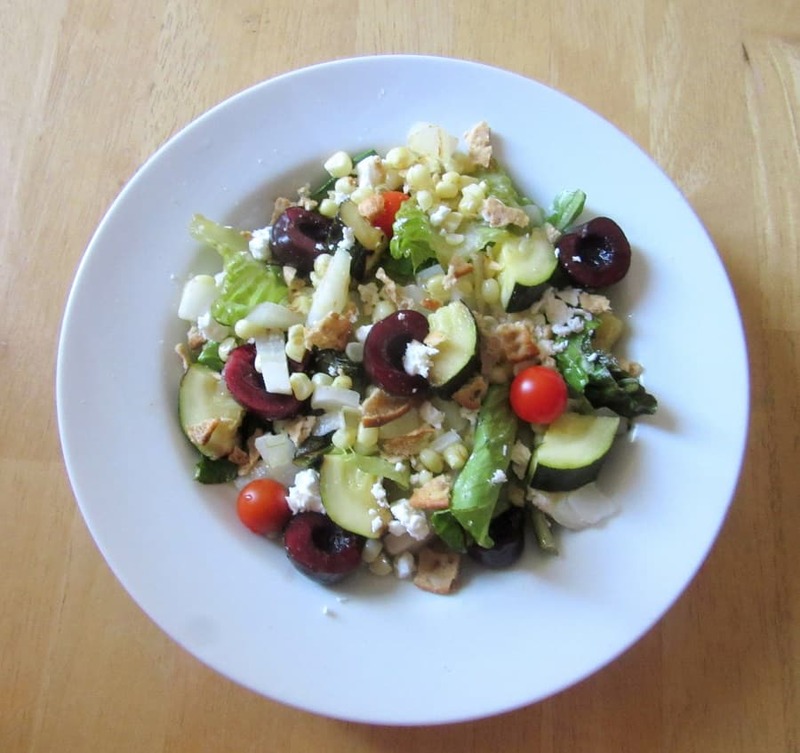 the feta adds a creamy saltiness. the pita chips/crackers to finish add a hard crunchy element (as opposed to the lettuce, which contributes more of a fresh crunch), though you could easily make the salad gluten-free and grain-free if you subbed in nuts (almonds are my go to’s) and/or seeds (sesame seeds or pepitas all the way). you can def add protein (beans, chicken, tofu, nuts, mozzarella, shrimp come to mind) if you want more of a filling, hearty salad. *This salad is perfect for leftover cooked zucchini, but if you don’t have any, halve the zucchini, and roast or grill under fork-tender before cutting the halves into half moons. Heat a medium pan with some oil over medium heat. Add the corn and onion. Saute until the onion is translucent and the corn is tender and no longer tastes starchy. Assemble the salad. Make a bed of romaine, then arrange everything on top. Drizzle balsamic vinegar and extra virgin olive oil on top to taste. Crumble pita chips/crackers on top and serve. Yay for continuing summer! Our school doesn’t start until way later this month either 🙂 I’ve definitely been celebrating with salads as well, though I’ve been missing feta and grilled zucchini from my meals lately so cheers for the meal idea! This sounds absolutely delicious! I will definitely have to try it out sometime!